Comstock Resources has announced plans to acquire 70% of Ursa Resources' interest in Eagle Ford assets in Burleson and Washington counties for $66.5 million. The deal includes one well producing 433 boe/d and 32,000 gross (20,000 net) acres. Not many wells have been drilled in the immediate vicinity, but good wells have been drilled to the northeast and northwest. Comstock will move a rig into the area in 2014 and is planning to drill 10 wells over the next year. The deal supplements Comstock's 31,800 gross (26,500 net) acreage position in Atascosa, Frio, La Salle, and McMullen counties. 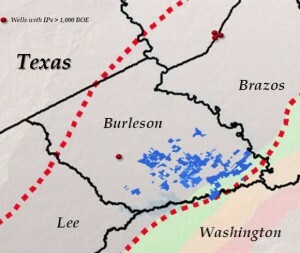 Comstock estimates its Southern Eagle Ford assets have potential for 300 locations, 450,000-550,000 boe EURs, and resource potential of 70 million boe. Just one week prior, Comstock announced the acquisition of 53,000 net acres targeting the Tuscaloosa Marine Shale in Louisiana and Mississippi for $54.5 million. The two deals combined significantly expand the company's potential to grow oil production.